Netflix’s “Bird Box” mobile experience made stops in the greater Los Angeles area and in Austin, TX. Netflix’s Dec. 21 film “Bird Box” has permeated the cultural landscape with countless memes, a dangerous Bird Box challenge (which Netflix swiftly denounced on social media) and an astonishing announcement from the streaming platform that some 45 million accounts had watched the film in its first seven days. But long before the craze took hold, promotional plans to build awareness and word-of-mouth buzz were in place. 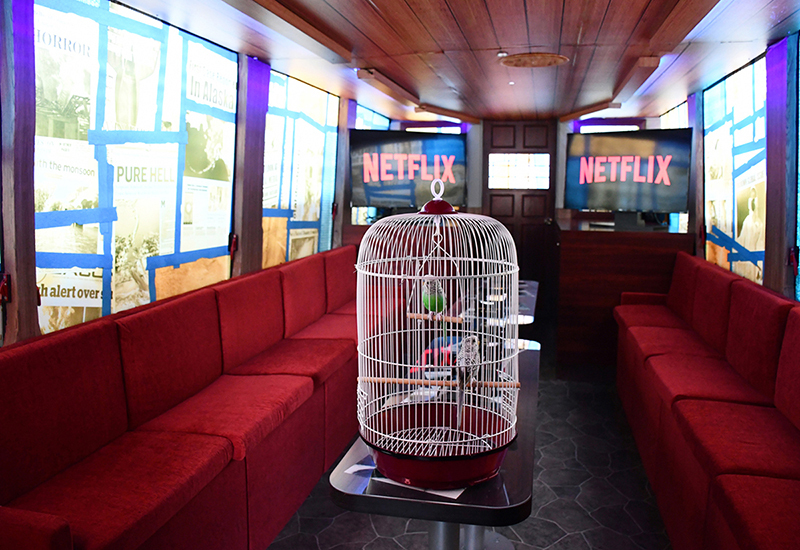 For the month of December and into January, Netflix toured a “Bird Box” mobile experience that made stops in the greater Los Angeles area and in Austin, TX, immersing attendees in a suspense-filled, three-minute journey inside a gutted, double-decker bus rebuilt as the film’s main set piece. 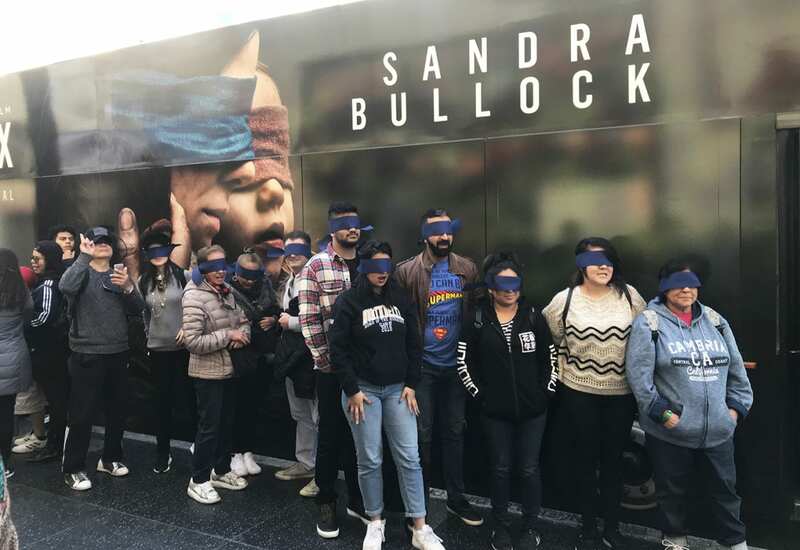 The vehicle, wrapped in a billboard featuring the film’s blindfolded star Sandra Bullock, was enough to pique the interest of curious passersby. 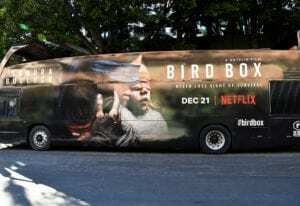 The artwork helped to advertise the film on Netflix and, while it was parked in greater L.A. neighborhoods including Venice Beach, Santa Monica, the downtown Arts District and L.A. Live, brand ambassadors convincing consumers to step into the bus—while blindfolded, of course—did the rest. Haven’t watched the film yet? Spoiler alert! In short, the psychological thriller depicts a world in which a deadly, unknown force begins to eradicate the population. In order to avoid certain death, survivors must not look at the force and wear blindfolds at all times while outdoors. After some time spent in a house initially presumed safe, Bullock’s character and her family must navigate a treacherous journey to safety, with the help of a box containing live birds that warn her through chirping when evil is approaching. Lacking stars from the film to lend legitimacy to the experience, Netflix relied on a plethora of the film’s eerie sounds, actual audio tracks and a/v trickery to recreate the film’s dystopic atmosphere. From the ominous sounds of the creature approaching to characters’ desperate pleas for help to birds maniacally chirping, the film’s soundtracks served to ground attendees within the doomsday scenario. 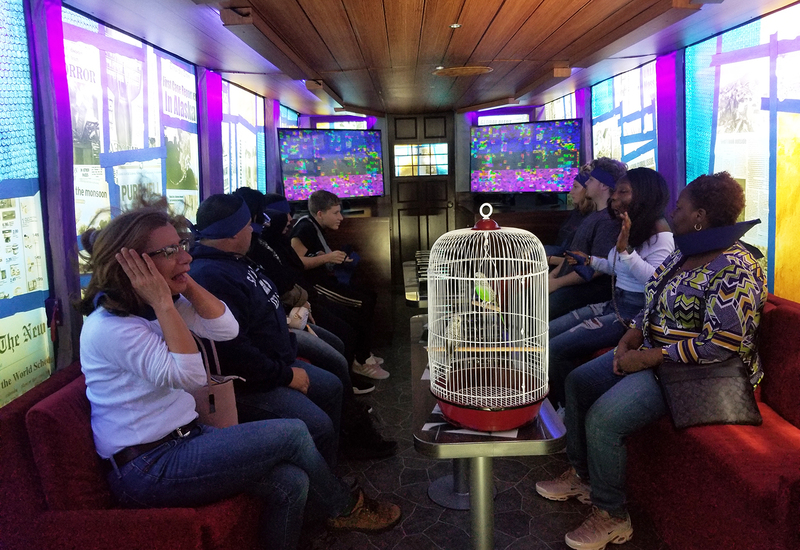 Here’s how the experience plays out: The first manner of business for brand ambassadors—blindfolding attendees who are waiting in line outside of the bus to enter. 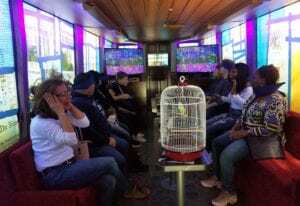 Next, a group of 10-12 consumers are carefully led onboard the bus and seated on a red sofa bench, a replica of the one from the film, across from a coffee table astute “Bird Box” viewers would also recognize. Each attendee is handed their own bird box, which doubles as a swag bag to be opened at a later time. Then, the experience, guided by audio and sound, begins. Guests are first warned, through the sound of a voice on a walkie-talkie, of the pending, treacherous river journey they must take. Then they are told sternly, by Bullock, not to take their blindfolds off during the journey under any circumstances. 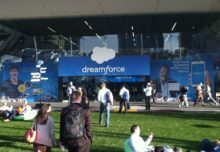 And then, a low rumbling begins to build, growing louder and louder until it surrounds attendees, reverberating through the benches they are seated upon. Air hoses behind attendees’ necks blow sudden puffs of air, adding to the suspense factor. The three-minute journey took place in a gutted, double-decker bus rebuilt as the film’s main set. The sounds subside, and attendees are prompted to take off their blindfolds. For the moment, it’s safe. 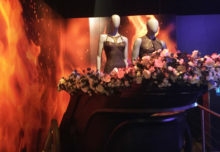 They are told not to look outside or meet the creature’s gaze indirectly through social media or video footage (which led to the demise of one character in the film). 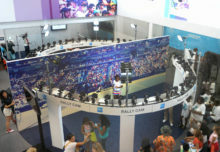 With blindfolds removed, consumers then view their environment. Newspaper pages taped across the windows, as in the film, prevent visual contact with the creature outside. Key props—a bird cage, twine, and a bell used for navigation—lay on the coffee table. And so does something else: sketches of the dreaded creature, created by a dangerous, mentally-deranged character in the film who turns on the protagonists. Two large TV monitors at the front of the bus begin to play a doomsday-style newscast warning of the global chaos that has ensued. Suddenly, it’s interrupted by a loud knock at the “back door” of the bus. A silhouette of a man appears at the window as he pleads for his life to be let into the sanctuary house. Heightening the scare, attendees are blasted with air at the moment of the knock, rumbling moves through the space as if to surround the bus, and the birds, from within a bird box set up at the front of the room, begin chirping wildly at “the evil” present. Fun production note: the silhouette behind the see-through window was created through lighting, sound and some a/v trickery—despite attendees’ belief that a real person was attempting to break down the door. And as the for the audio track, remember the guy stuck in the freezer at the grocery store who begged for his life? It was him. Oh, the horror! Back to the experience. The noise begins to pass and the news anchorperson issues another warning before the broadcast ends abruptly, switching to a color bar and emitting a long tone. Finito. The experience concludes with an invitation to exit upstairs to safety, where attendees who boarded the bus in the Hollywood area enjoy a neighborhood tour. 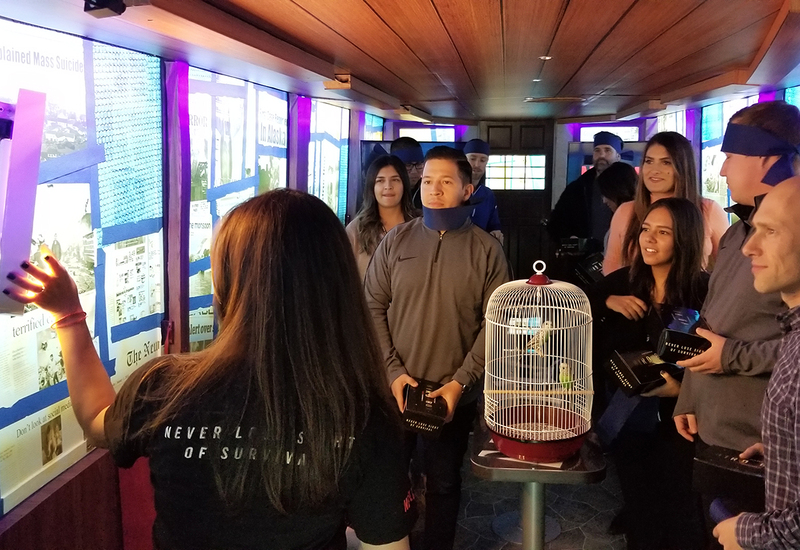 On the way out, attendees are encouraged to take a photo with “Bird Box” props using a selfie cam, which they can then email or text to themselves. 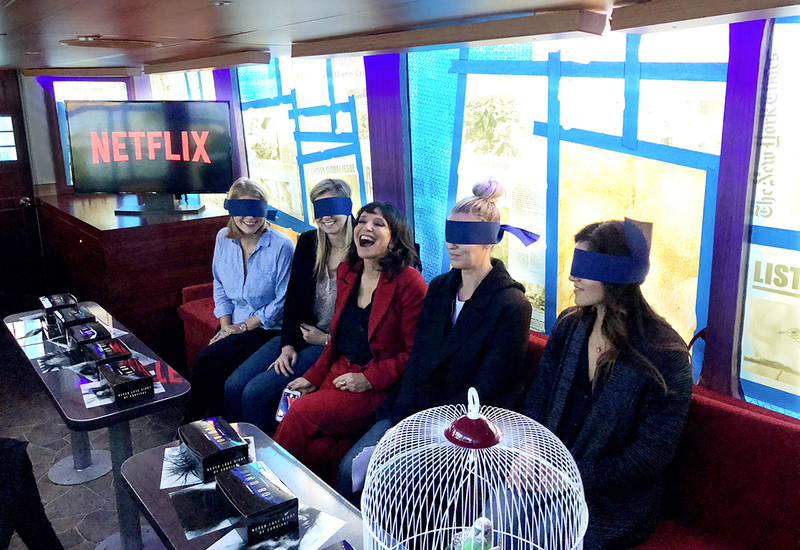 The swag bird box consumers take home features Pop-Tarts (a tasty find for a survivor of the apocalypse), a blindfold doubling as a sleep mask, a bell and some twine. 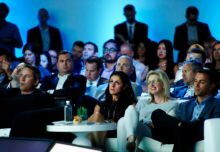 As for results, Netflix has far exceeded the goal of welcoming 200-250 guests a day, with the record being 584 people visiting the experience in Austin on Jan. 5. Agency: MC2, Chestnut Ridge, NY.